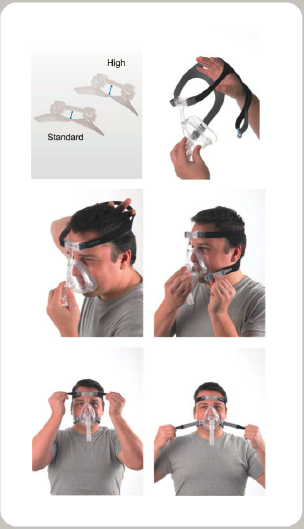 When your CPAP mask cushion is no longer in its prime, it can begin to lose its seal, causing air leaks and affecting the amount of pressure you receive. Don't let an old cushion compromise your therapy: replace the cushion in your APEX WiZARD 220 and get the right treatment with a dependable seal. Make sure your skin is clean, dry, and free of any makeup or moisturizers before wearing your mask. This will help you get a better seal and will also extend the life of your cushion. How do I clean my mask and mask parts? All parts of your APEX WiZARD 220 mask, including the cushion, can be hand washed in warm water with mild soap. Be sure not to use any alcohol-based cleaners or scented oils. How do I know if I have a good fit on my mask? Your mask should have a secure seal while remaining comfortable. If you have to adjust your headgear to the point where it's painful to get a secure seal, your mask is probably not the right size.